Every time Quickspin slot provider announces a new video slot, we definitely should expect at least a visually stunning slot. This time and it’s not only eye appealing slot but also a game that can earn you a lot of money. We are talking about life changing more than 5000x win. 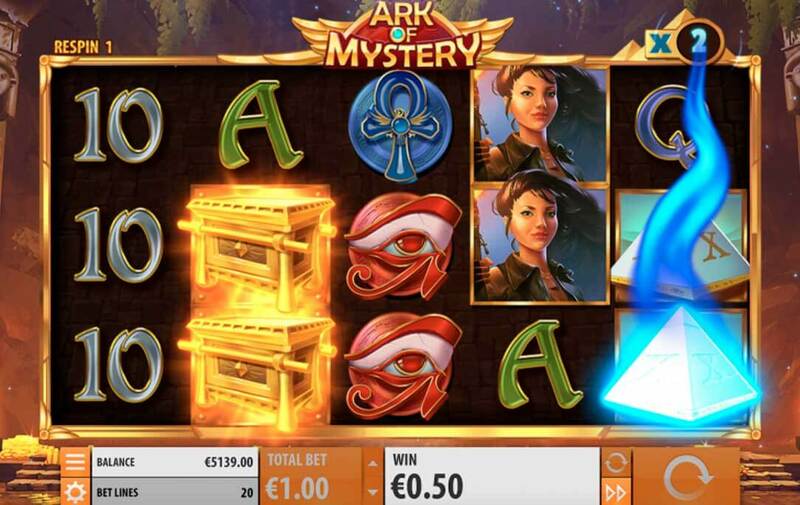 Go ahead and read our Ark of Mystery slot review to find out how to hit some huge wins on it. The main character of Ark of mystery slot is Anna, a beautiful young explorer. She is ready to help you to find all Egyptian treasures. All you need is some luck and wilds, of course! You will enjoy every spin you’ve made on this slot. Visually it looks just perfect. It’s one the best Ancient Egypt themed slot out there. Ark of mystery is a 5-reel 20 pay line slot. You can choose stake from €0.20 to €100 per spin. You can play this slot even on low money, so check some of the best casinos with small minimum deposit right now. It’s a good choice for you to have fun without investing too much. Also enjoy multiplatform support and play this slot on any modern pc, smartphone or tablet. Best paying symbol is Anna girl itself, you can win 50x your bet per full line. Catch her once and fell in love with her forever. It’s all about how exciting it to play slot for most of the players. So sometimes, it’s hard for developers to add a lot of things to the slot and keep payments of this slot high at the same time. Due to this reason, there is no free spins or bonus in this slot. However, there are two main features you can get on this slot wild ark respins and multiplier booster. It seems like there is a big win right around the corner every time you make a spin. You can get a golden ark wild symbol on any of the three main reels. Once you get it, you will receive a respin. Wild will on expand on every respin by one symbol, so there is a minimum 2 respins and maximum 6 respins total. That’s total 9 wilds! But that’s still not enough to win big in this slot, if you want to hit a jackpot you need to catch a multiplier booster as soon as you hit you first wild respin. Every time you make a spin, you can catch a special multiplier booster symbol. It looks like a pyramid with X on it. It can only appear on the last real, and it can multiply your winnings by amazing up to 22x. This a game changer when it comes to payouts of this slots, so don’t expect any huge wins without it. Ark of mystery RTP is a typical 96.5% number which nothing special. However, when comes to big wins, this slot can show you up to x6509 bet. Which is a huge win, no matter which bet you choose? Win condition in this slot is to catch golden ark wild respins and multiplier booster together. If you catch wild on each of the three middle reels, expect a huge win. When you play, Ark of Mystery keeps in mind that this is a high variance slot, which means that you can have many empty spins, before you catch something. Which doesn’t make this slot good for wagering? You will be able to trigger special features all the time without big wins, so don’t get lost there. Even if it looks like you are about to hit a huge win. It can take more than 1000 spins to get something decent. However, if you are to risk your money and aiming for a big one Ark of Mystery if your choice. Just don’t bet too high. Another good attempt for Quickpin to make a slot with huge wins. From a visually stunning graphics to huge potential win, everything is right about this slot, except maybe lack of free spins feature. We suggest you play this slot, especially if you are a big fan of ancient Egypt and crazy wild respins.